St. Agnes Hospital is located in Baltimore, Maryland (Baltimore City). Founded in 1862 as the first Catholic hospital in Baltimore, St. Agnes is now a general hospital, which prides itself on specialized services in the areas of emergency and trauma medicine, breast cancer, orthopedics, cardiology, plastic and reconstructive surgery, neurology, a wound center, and obstetrics and gynecology. It is also heavily advertising the use of da Vinci robotic surgical procedures. 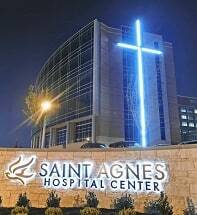 St. Agnes has 287 beds, and in 2011 there were 1,863 births; 83,308 emergency room admissions; and 10,918 surgical visits. This Southwest Baltimore hospital employs 800 physicians and is also a teaching hospital (meaning much care is performed by residents). In 1999, Saint Agnes’ parent organization, The Daughters of Charity National Health System, merged into the Sisters of St. Joseph Health System to form Ascension Health, which is the largest non-profit healthcare organization in the nation. Apparently, flush with cash, St. Agnes is apparently still looking to grow. The hospital made a big play to buy St. Joseph's Hospital, losing out to University of Maryland Medical Systems. In 2012, the hospital bought the historic Cardinal Gibbons School in Baltimore with plans to put housing and offices in the closed school. The hospital also completed in 2011 the St. Agnes Hospital Campus Expansion Project, building a new patient tower with 120 private rooms that cost over $212 million. This completely remade its cancer institute, building a new medical office building, and renovating everything in sight. In 2015, Saint Agnes broke ground on new construction on yet another new project which will be a mixed-use development of housing, and medical offices on the 32 acres they purchased that was once Cardinal Gibbons High School. The take home message is that St. Agnes is not ceding Baltimore to Johns Hopkins and UMMS, two national heavyweights in their backyard. The emergency room doctors at St. Agnes are employees of CEP America, which subcontracts with the hospital to provide emergency room physicians. This is an excellent hospital that we think takes seriously its obligations to its patients and, as a Catholic hospital, to the community. Our law firm has represented employees of St. Agnes in personal injury cases and they have universally heard nice things about working there. St. Agnes does not have a "Big business, we are trying to make as much money as we can while pretending to be a non-profit" vibe to it. As with most Baltimore City hospitals, medical malpractice cases against St. Agnes are almost invariably filed in Baltimore City Circuit Court. The City typically offers a good jury pool, fair judges and cases will generally get to trial just over a year after filing. Underscoring the advantages of Baltimore City, there have been at least two large medical malpractice verdicts in Baltimore City in 2012, including a $55 million verdict and a $21 million verdict. Having a malpractice lawsuit in Baltimore is hardly a guarantee of success. But what you do get in Baltimore is a fair shake -- jurors do not assume that a doctor cannot make a grave mistake that can cause a serious injury or death. St. Agnes has been defended by the law firms of Waranch & Brown (Towson), Pessin Katz Law, P.A., Goodell, DeVries, Leech & Gray (Baltimore), and Whiteford, Taylor & Preston to name a few. St. Agnes was a defendant in the famed Court of Special Appeals D'Angelo case, which caused all sorts of problems for Maryland medical malpractice attorneys who wanted a clear path of the rules for filing certificates of merit (that case was defended by Gary Dumer of Dumer, Harrison & Barnes, P.A.). St. Agnes has mostly been able to steer clear of malpractice verdicts. Our firm had a $5.2 million verdict in a malpractice case that occurred at St. Agnes in 2014. But the case focused on the emergency room doctors who are independent contracts of the hospital. If you believe that you have a medical malpractice lawsuit against St. Agnes Hospital or any other hospital in Maryland, contact our medical negligence lawyers at 1.800.553.8082, or send us a free internet request for consultation.